MIAMI, FL, (March 12, 2010)– Hosted by actors Boris Kodjoe and Nicole Ari Parker-Kodjoe, the star-studded UPTOWN Escape Salute to Excellence Awards Dinner with guests to include contributing honorees actress Nia Long, Grammy Award winning songwriter/producer Bryan Michael Cox, music executives Steve Rifkind of SRC Records and Ted Lucas of Slip n Slide Records, super producers Cool & Dre, Roger Bobb of Tyler Perry Studios, and Will Packer and Rob Hardy of Rainforest Films and producers of the blockbuster movie Obsessed starring Beyonce and Idris Elba. In addition to the honorees, attending the Salute to Excellence Dinner includes Supermodel Cynthia Bailey, Kevin Liles, and a bevy of celebrities, music industry executives, and power players in business and entertainment. The Salute to Excellence Dinner will also benefit the Sophie’s Voice Foundation founded by actors Boris Kodjoe and Nicole Ari Parker-Kodjoe after their daughter, Sophie, was diagnosed with the birth defect Spina Bifida. The organization is on a mission to raise $2 million to help finance a trial revolutionary new surgical procedure for 20 children diagnosed with Spina Bifida. Held during the weekend of March 18th-22nd with South Beach serving as the backdrop and the illustrious Gansevoort South Beach hotel as host, the Salute to Excellence Dinner is part of a greater weekend of events dubbed the “UPTOWN Escape, 2010: An Upscale Getaway” presented by UPTOWN Magazine and the Peter Thomas Entertainment Group. UPTOWN Escape is a five-day long luxury retreat to an urban oasis where social networking marries entertainment to create an unforgettable union of nightlife, music, business innovation, and cultural experiences specifically catered to the socially elite. 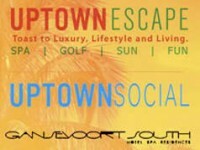 Other events to be held during the UPTOWN Escape weekend include an exclusive opening reception on Thursday, March 18th at Philippe Chow; a Celebrity Golf Invitational on Friday, March 19th hosted in conjunction with the City of Miami Gardens and the 5th Annual Jazz in the Gardens music festival with a plethora of NBA and NFL athletes attending and held at the prestigious Fairmont Turnberry Isle Resort & Club in Aventura; the UPTOWN Escape Girl’s Day Out Beauty Suite sponsored by CoverGirl Queen Collection and the Nielsen Media Company; and a host of other private parties and events. Registration to the UPTOWN Escape Salute to Excellence Dinner and the other weekend of events can be done online at www.UPTOWNEscape.com.